Back in November, Serena tagged me to list things that make me happy. I don't do many tags and this one slipped my mind until I saw another blogger do it this week. Not going to lie, ideas for posts have been scarce lately, especially as it seems that my reading and knitting have been progressing slowly. So there it is, a list (though a rather predictable one) of things that make me happy. :) I hope you all are having a lovely week. Spinning: naturally colored American wool. 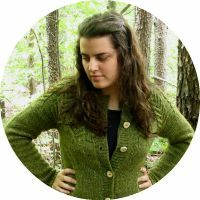 Last spring, I decided to spin enough yarn to knit a shawl inspired by the Nordic Wind shawl. I wanted to use handspun for the shawl, but I also wanted to use American wool in undyed colors, preferably from small farms. 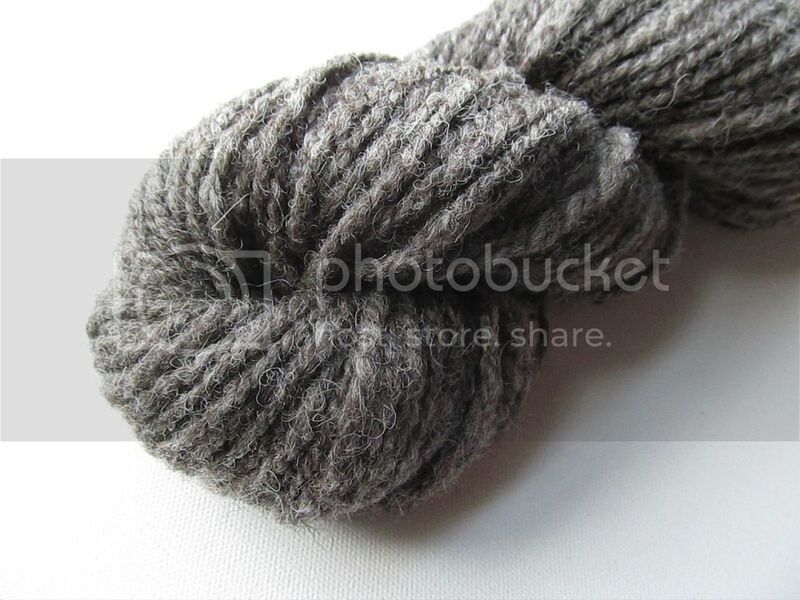 I bought eight ounces of gray Jacob roving from Hearts of the Meadow Farm in West Virginia. 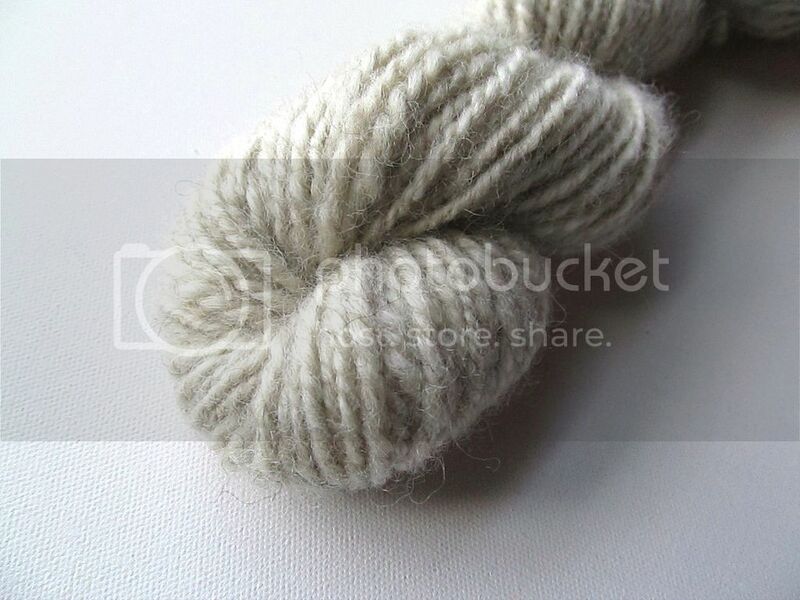 I also got four ounces of white/cream Coopworth roving from that same farm. 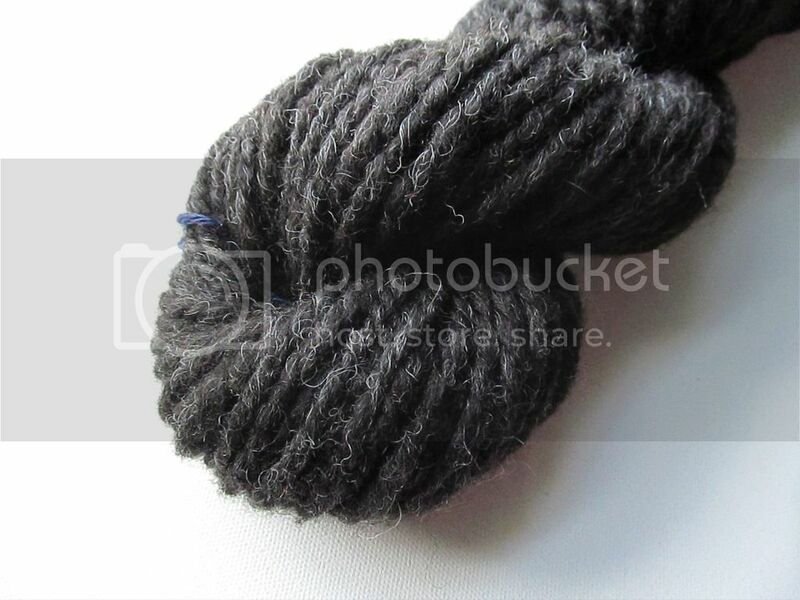 Then I ordered four ounces of black Shetland fiber from Foothill Fiber Farm in California. I originally planned on using two shades of gray, but I had a hard time finding shades that were different enough. This was my first time spinning all of these breeds. 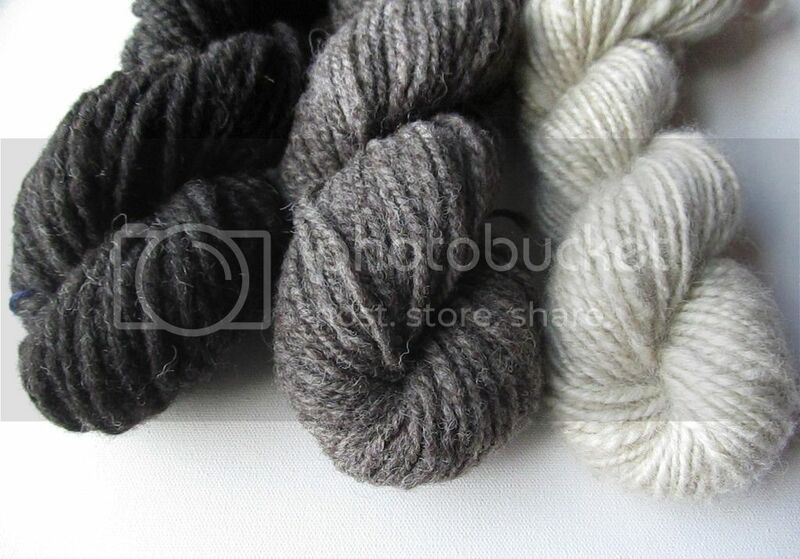 The Jacob is rustic but the perfect shade of gray...I'd like to spin enough of it for a sweater sometime. The Coopworth was similar to other breeds I've spun before, and I don't know if you can tell, but it has a bit of shine since it's a longer wool. 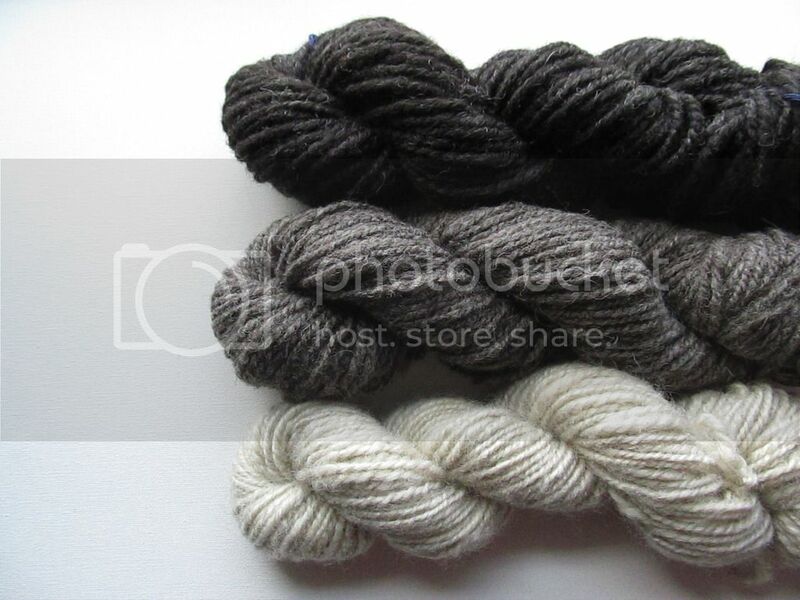 The Shetland was definitely my favorite to spin of the three. It's so soft and fluffy! It looked slightly thinner than the other two when I was spinning it, but after soaking it, it puffed up so much that it's now the thickest of the three. With a pound of fiber and nearly 400 yards of finished bulky yarn, this is the most spinning I've done for a project so far. 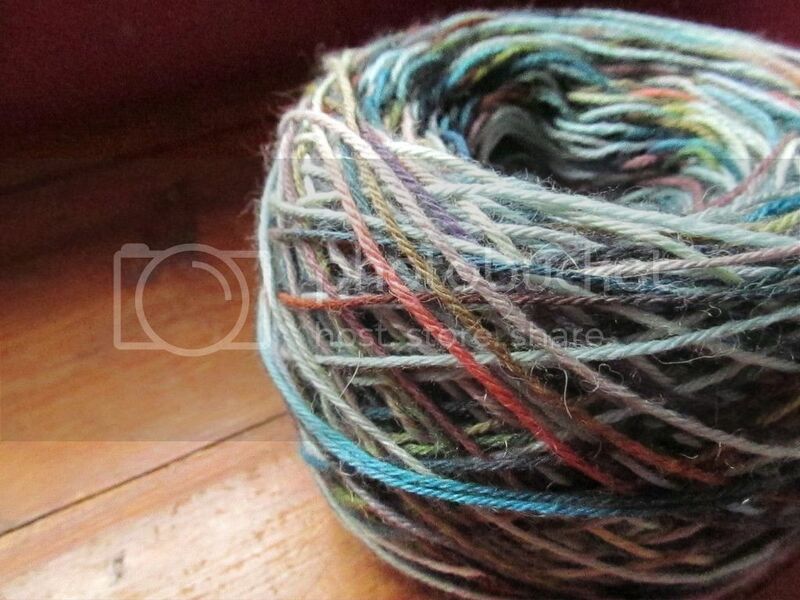 It feels good to have supported small farms and to know exactly where this yarn came from. I'm excited to knit the shawl! I'm planning on using the Boneyard Shawl pattern, leaving off the garter ridges and adjusting needle size for my heavier yarn. Knitting: After taking a week off to make a couple of hats, I'm back to knitting on my new sweater. I'm doing that second-guessing thing that I always do when I'm knitting a sweater: one minute I'm confident that it'll fit fine, and the next I'm convinced that it's going to turn out too large or too small. I'm a couple of inches past the underarm, and after trying it on, it looks like it'll be slightly looser than I expected, but hopefully not too big. (And this is after going down a sweater size and a needle size.) The interesting texture at the top is finished, so now it's nothing but mindless stockinette stitch for quite a while. I'm always wanting to read more classics, but I have to admit that I usually find them intimidating. And Thomas Hardy was especially intimidating, because of the things I'd heard about Tess of the d'Urbervilles and how depressing his books tend to be. Now I feel silly for waiting so long to read Far From the Madding Crowd, because I loved this book! It took me a while to adjust to the wordiness of his writing style. Every once in a while I was tempted to skim, and sometimes I would reread a sentence over and over and still have no idea of what he was trying to say. :) But a lot of his descriptive passages were really beautiful, especially the nature ones. Two of my favorites were when Gabriel was out at night under the stars, and later on when the thunderstorm was coming. Let's talk about the characters. First of all, best character names ever! I have very mixed feelings about Bathsheba Everdene. I disliked her for most of the book, for being so snobbish and flighty and for making really stupid decisions without ever considering other people's feelings. Her bad choices didn't just affect her...they affected a lot of people. But somehow Thomas Hardy managed to make me feel sympathetic towards her at certain times, even though she'd brought all of it on herself. I did feel like she'd grown and come to her senses by the end, though. I loved Gabriel Oak from the beginning. He was silly for proposing to Bathsheba so soon, and honestly, she did nothing to deserve his devotion throughout the entire book. But besides that, Gabriel proved himself to be the best sort of person: kind, dependable, selfless, loyal, and a darn good farmer/shepherd at that. :) I fully expected to dislike Farmer Boldwood (because he's not Gabriel! ), but he was actually a pretty good guy to start off. He did get obsessive and stalkerish later on, but I blame Bathsheba for that. Sergeant Troy: I have nothing to say about that jerk. He was trouble from the beginning. But...Hardy even made me feel sorry for him. Apparently he really did love Fanny. Far From the Madding Crowd was unlike anything I've ever read. I was drawn in from the beginning and though it took me almost two weeks to read, I didn't want to put it down. None of the characters were perfect, but they were so human. Even the worst of them still had tiny bits of goodness. I also really liked all of the Biblical references...it was interesting how they were incorporated into the writing. This book was slightly depressing and dramatic, but also beautiful and funny (the gang of farm workers cracked me up) and profound at times. I'm so glad I finally read it, and it's a new favorite. To me, this film is like the Thomas Hardy version of the 2005 Pride and Prejudice (which happens to be my favorite movie). In other words, it's a really beautifully done, condensed version of the book. Emphasis on beautiful, because everything about this film is just that: the soundtrack, the cinematography, the settings where they filmed, the costumes, everything. It's such a pretty movie. 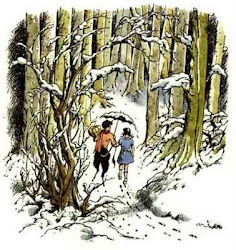 Overall, it's a decent adaptation of the book. Of course, they had to cut out a lot (it only lasts 2 hours), and they also rearranged certain things. Things happen very quickly in the film, and there were a few parts that I thought would be confusing or rushed if you hadn't read the book first. But sometimes I'd be surprised by little parts they left in, like Bathsheba lying backwards on her horse to go underneath the low branches, or the toad that Gabriel sees before the storm. 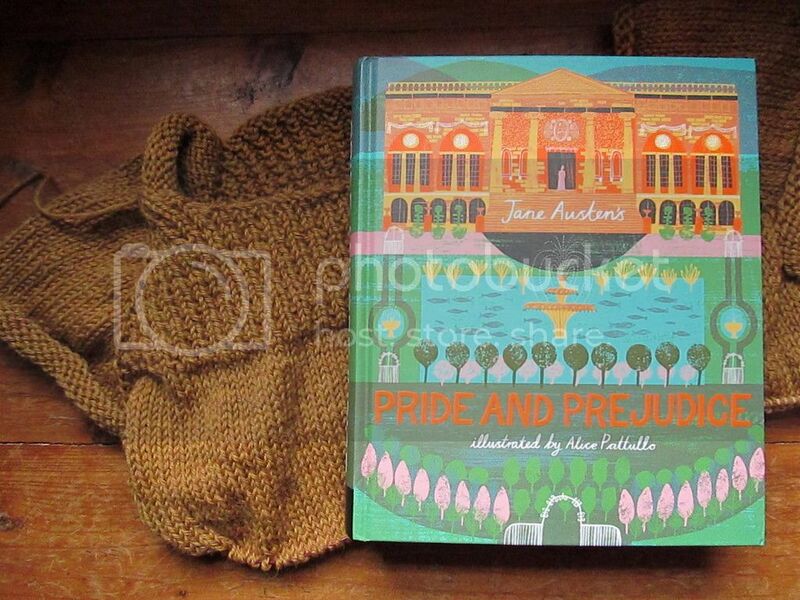 I loved the book, and I really liked this adaptation. The book is much better, of course, but I still enjoyed the film and I'm sure it will grow on me even more. 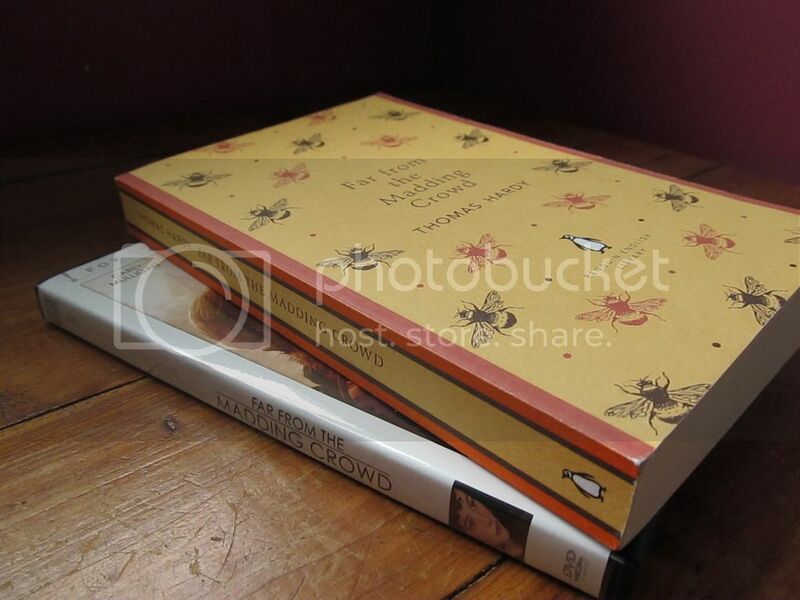 Have you read Far From the Madding Crowd or seen any of the adaptations? What did you think?